There was always a need for a Chapel at Florence, when it was rainy or cold it really called for a venue under a new roof. In the first year of the Venue (2012) a very dear friend of mine told me about this gem. The old Windows of a Church that she new of, that was for sale. At that point of time money was still not easy, but I decided that this is a once off and I need to get hold of them. I borrowed money and bought them. When we came back, after seeing so many magnificent buildings and churches, I asked Nico what he brought back form the trip, and he said that he really think it is worth wile putting in extra detail and attention. I was intrigued with the bells, in every small town we went to, at some point every evening the whole town’s bells were ringing. I came back and I wanted our Chapel to have 7 bells. (The perfect number) The sound of bells is inviting and it announces something. The sound is also like the love of The Lord it is every where, all around you even thou you cant see of touch it. We live our live according to Acts17.22-28. and for us the bells was a sign. I told every body about the bells and one by one the arrived at Florence, big and small and we designed the Chapel in the way that the Groom and his men will ring the bells for his Bride to come to get married. In the forest and at the main entrance, we placed statues of children playing joyful instruments, because of the joyful day and the joy to the world that The Lord has brought. 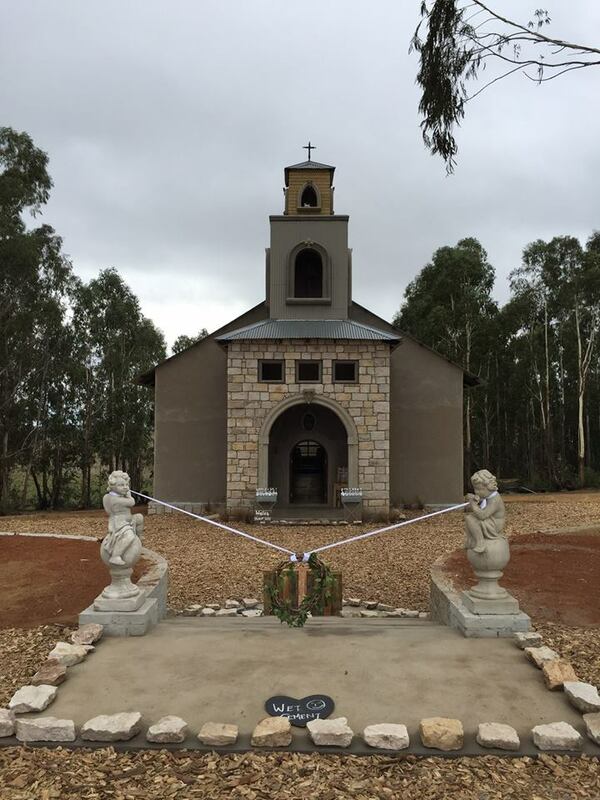 We started to build in June 2015 and opened the Chapel for the first wedding end of November 2015.